BROOKLYN, Mich. (Aug. 1, 2018) – Grant Enfinger, driver of the #98 ThorSport Racing Team Ford F-150 in the NASCAR Camping World Truck Series stopped at the Toledo Zoo on Wednesday for a day of fun. He was in town to promote the Corrigan Oil 200 at Michigan International Speedway on Aug. 11. PHOTO via Michigan International Speedway: (L to R): Grant Enfinger, driver of the #98 ThorSport Racing Team Ford F-150 in the NASCAR Camping World Truck Series stopped at the Toledo Zoo on Wednesday for a day of fun. 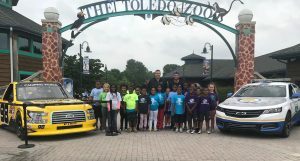 Enfinger met a group of children from the Boys and Girls Club of Toledo at the front entrance of the zoo to take a photo between his race truck and the Michigan International Speedway pace car. Enfinger was ready for his day of fun at the Toledo Zoo, but was already looking forward to the Corrigan Oil 200. The day started with the Boys and Girls Club of Toledo at the Artic Encounter viewing the polar bears and seals in their habitats. While there, Enfinger passed out a design of his truck and asked the children to color it. He then selected four of the designs to convert to decals that will be on his truck for the Corrigan Oil 200. Enfinger and Michigan International Speedway President Rick Brenner had one more surprise for the children when they presented a $1,000 check to the Boys and Girls Club of Toledo. Enfinger then got an exclusive behind-the-scenes look at the animal care at the zoo and some of it was hands on. As he made his way into the elephant exhibit, Enfinger learned what it took to care for the animals. Then he was able to assist in giving Lucas the elephant a bath and gave him some treats. Renee the elephant showed her skills by waving a checkered flag and a special Enfinger flag for the driver. Enfinger concluded his day at the rhino exhibit. After a brief lesson in proper etiquette, the animal care givers took Enfinger right into the exhibit. He was able to feed the rhino and interact with him. Fans can see Enfinger in action at the Corrigan Oil 200 on Aug. 11. Tickets start at $30 for the truck race and can be purchased at www.mispeedway.com. Kids 12 and under are free for the race. Tickets start at $35 for the Consumers Energy 400 on Aug. 12. Fans can find the perfect campsite for their families and friends in any of the different campgrounds at the track starting at $170. Fans can purchase tickets and campsites at www.mispeedway.com or by calling 888-905-7223. Children 12 and under are free on Friday and Saturday. On Sunday, children 12 and under tickets start at $15. Children 12 and under can attend three days of NASCAR action for just $15, ensuring families a weekend of fun at affordable prices. NASCAR’s most entertaining track is providing memorable experiences for fans during the Consumers Energy 400 in August. The entertainment starts early in the week and will go right through the checkered flag for the Consumers Energy 400. On Saturday, fans can enjoy a special post-race concert featuring The Cadillac Three and Logan Mize. The concert is free to anybody with an admission to the Consumers Energy 400 on Sunday. In the campgrounds, fans can experience a Medium, play bingo, partake in a variety of fitness programs and watch a movie under the stars. The track will even have face painters, crafts, outdoor games, a magician and a DJ for the kids. The party goes late into the night with NightCap. The fan plaza will feature live music entertainment and strolling street performers for guests to enjoy as they prepare for the race. In addition, guests can enjoy a wood carving show.